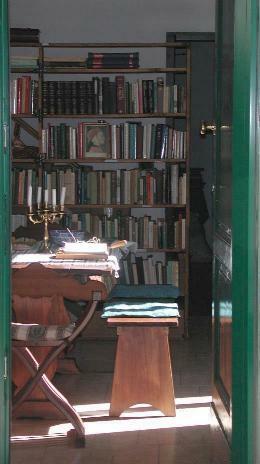 The Cemetery's Library, called the Mediatheca 'Fioretta Mazzei', is both very beautiful and very useful. We particularly seek books by and about the persons buried here to be part of the Cemetery's archive, which also contains meticulous hand-written registers in French on the funerals and burials. It is here we help Roma learn the alphabet and create books in their three languages, Romany, Romanian, Italian and a fourth, my English, and with their fine but perspective-less drawings. Our rule for the library is that to be a member one gives it a book a year or contributes in some way to the library and the cemetery or both. And the rule works splendidly, the books pouring in, the Roma building bookshelves along with their wooden rocking cradles here, plants arriving for the garden and much more. I once was a member of a theological library in London, Sion College, alas, now dead as a dodo, but which had a wonderful rule, that they could send books to country scholar priests and immured scholar nuns by post. I continue that rule, our catalogue being posted on the web (at http://www.florin.ms/biblioteca.html)and monks and priests from all over the world send books and borrow books. Packages of theological, contemplative books arrive from as far away as Malaysia, some, bought in the bazaar, needing our restoration from book-worm! Let me tell you of one book. It is the Summula Patristica ad usum alumnorum clerique indigene, printed in Hongkong in 1949. It contains the Church Fathers and Mothers, beginning with Acta Martyrum which includes that of Saints Pepertua and Felicity and continues through Saints Jerome, Augustine and Ambrose, all in Latin. Among its pages I found a quarter of a page, part of a letter asking the Charterhouse monks to please pay their bills, on the other a list of their books they were publishing to attempt to pay those bills. I smiled, for their situation is so much like mine, where we publish books we create ourselves, EBB's sonnets from the Portuguese, Julian of Norwich's Showing of Love, to attempt to pay the bills for the restoration of the tombs in this cemetery. We live in an economy of reciprocity, a sort of food chain of money. If a link breaks then work cannot be done, hunger results. This far-travelled book is not unlike the regimental spoon we write about in the Cemetery website, http://www.florin.ms/yelverton.html It's a tangible artifact with a long long story, both journeying in time and space. Just like our tombs, our books have splendid stories they can tell us.